the terminal part of the upper limb of a human or a nonhuman primate. ape hand one with the thumb permanently extended. cleft hand a malformation in which the division between the fingers extends into the metacarpus; also, a hand with the middle digits absent. obstetrician's hand the contraction of the hand in tetany; the hand is flexed at the wrist, the fingers are flexed at the metacarpophalangeal joints but extended at the interphalangeal joints, and the thumb is strongly flexed into the palm. writing hand in Parkinson's disease, assumption of the position by which a pen is commonly held. Alfred, U.S. pediatrician, 1868-1949. See: Hand-Schüller-Christian disease. The portion of the upper limb distal to the radiocarpal joint, comprising the wrist, palm, and fingers. (hand) the distal part of the upper limb, consisting of the carpus, metacarpus, and fingers. cleft hand a malformation in which the division between the fingers extends into the metacarpus; often with just two large digits, one on either side of the cleft. mitten hand a hand in which several fingers are fused together and have a common nail. writing hand in paralysis agitans, assumption of the position by which a pen is commonly held. the part of the upper limb distal to the forearm. It is the most flexible part of the skeleton and has a total of 29 bones, 8 forming the carpus, 5 forming the metacarpus, 14 forming the phalangeal section, and 2 sesamoid bones. Also called manus. 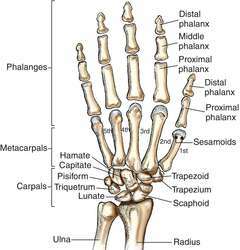 The terminal part of the upper extremity, containing carpal and metacarpal bones and phalanges. See Alien hand, Bayonet hand, Clawhand, Machinist's hand, Main-en-trident, Rosebud hand, Spade hand, Windmill hand. A deformity of the hand in which the thumb is permanently extended, usually caused by a median nerve injury. Paralysis and atrophy of the thenar muscles result. Condition of the hand in which there is flexion of some of the fingers, especially of the terminal phalanges. The hand at the wrist may be extended. The condition may be caused by paralysis of the ulnar and median nerves. 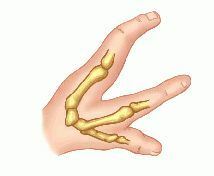 A bipartite hand resulting from failure of a digit and its corresponding metacarpal to develop. Stiffness and fibrotic contractures of the metacarpophalangeal (MCP) and proximal interphalangeal (PIP) joints in patients with advanced diabetes mellitus. In American Sign Language, the hand that moves during the formation of a sign. The position of the hand in tetany with extension at the metacarpophalangeal and the interphalangeal joints, and adduction of the thumb. It is named for the position of the obstetrician's hand during vaginal examination. A deformity of the hand caused by chronic arthritis in which the phalanges appear to be telescoped into one another like an opera glass. A deformity of the hand in which the tips of the thumb and first finger are touching and the other fingers are flexed as if holding a writing instrument. 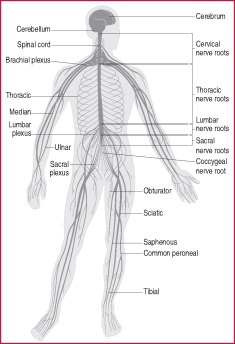 This is seen in Parkinson's disease. a complex musculoskeletal structure, allowing the complexity of movements required. 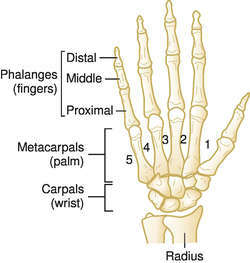 The carpal bonesat the wrist articulate with the five metacarpals, and each of these in turn with the first of the three phalanges of each digit. There are many small muscles attached between the various bones, which contribute to finger and thumb movements together with the long tendons of the forearm muscles which span the wrist in their tendon sheaths. hand injury is most common in sports such as basketball, rugby, cricket, volleyball, handball, etc. Injuries include ligament sprains, fractures and dislocations. Figure 1. 1. unit of measurement of height in a horse; hands high, abbreviated hh. 1 hand = 4 inches = 10.16 cm. 2. the terminal part of an upper extremity of a primate. a restrained gallop at less than top speed. Q. why my hands are getting purple and freezing? Q. Is it possible to have fibromyalgia in your feet and hands? Can you explain? I am very eager to know whether anybody is here with the symptoms of mine. My thumb hurts so much that it's difficult for me to write, and both my feet hurt when I put any weight on them. My hands and feet used to be the only parts of my body that didn't hurt. Is it possible to have fibromyalgia in your feet and hands? Can you explain? Q. Itches on hands when i go out in sun When go out and when sun rays fall on my hand at the end of the day it starts itching bady and it becoms sowlen. Can any one tell reason for this and a solution. A. i don't use any lotion or creams. It happens only on my hands and only when sun rays fall on my hands. And small rashes also comes.